Short-season forage radish (Raphanus sativus L. var. longipinnatus) has recently gained great popularity in Middle Tennessee and many parts of the world used as a high-quality vegetable crop for human consumption or a forage crop for winter grazing and cover cropping. In this study, we (i) estimated soil pH buffering capacity and microbial activity, (ii) quantified crop productivity influenced by different biochar amendment rates and N fertilizer management practices based on a factorial treatment design. Particularly, biochar was amended at rates of 0, 5, 20, and 40 Mg/ha; N fertilizer was applied at zero (N0), 122 kg/ha of urea (56 kg/ha of N; N1) and 4.8 Mg/ha of aged dairy cattle manure (56-60 kg/ha of N), providing a total of 12 treatments (four biochar rates × three fertilization practices). The combination of biochar and inorganic N fertilizer such as urea appeared to have positive impacts on the short-term biomass production, soil pH buffering capacity, and enhanced soil microbial activity for short-season forage radish production (P < 0.05). Future research is warranted to evaluate the use of biochar in field-based forage/vegetable studies in Tennessee. Anderson C., Condron L., Clough T., Fiers M., Stewart A., Hill R., Sherlock R. (2011): Biochar induced soil microbial community change: Implications for biogeochemical cycling of carbon, nitrogen and phosphorus. Pedobiologia 54: 309–320. Asai H., Samson B., Stephan H., Songyikhangsuthor K., Homma K., Kiyono Y., Inoue Y., Shiraiwa T., Horie T. (2009): Biochar amendment techniques for upland rice production in Northern Laos: 1. Soil physical properties, leaf SPAD and grain yield. Field Crops Res. 111: 81–84. Atkinson C., Fitzgerald J., Hipps N. (2010): Potential mechanisms for achieving agricultural benefits from biochar application to temperate soils: A review. Plant Soil 337: 1–18. Castaldi S., Riondino M., Baronti S., Esposito F., Marzaioli R., Rutigliano F., Vaccari F., Miglietta F. (2011): Impact of biochar application to a Mediterranean wheat crop on soil microbial activity and greenhouse gas fluxes. Chemosphere 85: 1464–1471. Chan K., Downie A., Joseph S., Meszaros I., Van Zwieten L. (2007): Agronomic values of greenwaste biochar as a soil amendment. Australian J. of Soil Res. 45 (8): 629–634. Chen G., Clark A., Kremen A., Lawley Y., Price A., Stocking L., Weil R. (2007): Brassicas and mustards. In: A. Clark, editor, Managing cover crops profitably. 3rd ed. Sustainable Agric. Res. and Education, College Park, MD. p. 81–90. Chen Y., Shinogi Y., Taira M. (2010): Influence of biochar use on sugarcane growth, soil parameters, and groundwater quality. Aust. J. Soil Res. 48: 526–530. Chen H., Du Z., Guo W., Zhang Q.Z. (2011): Effects of biochar amendment on farmland soil bulk density, cation exchange capacity, and particulate organic matter content in North China Plain. (in Chinese.) Chinese J. Appl. Ecol. 22: 2930–2934. Dean J., Weil R. (2009): Brassica cover crops for nitrogen retention in the mid-Atlantic coastal plain. J. Environ. Qual. 38: 520–528. Deenik J., Uehara G., Sumiyoshi Y., Sidibe A., McClellan A., Antal M. (2008): Charcoal volatile matter content and its effects on plant growth and biological properties of an infertile tropical soil. Abstract #665-665. Proc. Joint Annual Meeting of GSA, ASA-CSSA-SSSA, and GCAGS 2008. Dempster D., Jones D., Murphy D. (2012): Organic nitrogen mineralisation in two contrasting agro-ecosystems is unchanged by biochar addition. Soil Biol. Biochem. 48: 47–50. Gieske M., Ackroyd V., Baas D., Mutch D., Wyse D., Durgan B. (2016): Brassica cover crops effects on nitrogen availability and oat and corn yield. Agron. J. 108: 151–161. Glaser B., Lehmann J., Zech W. (2002): Ameliorating physical and chemical properties of highly weathered soils in the tropics with charcoal: A review. Biol. Fertil. Soils 35: 219–230. Gundale M., DeLuca T. (2007): Charcoal effects on soil solution chemistry and growth of Koeleria macrantha in the ponderosa pine/Douglas-fir ecosystem. Biol. Fertil. Soils 43: 303–311. Hossain M., Strezov V., Chan K., Nelson P. (2010): Agronomic properties of wastewater sludge biochar and bioavailability of metals in production of cherry tomato (Lycopersicon esculentum). Chemosphere 78: 1167–1171. Hossain M., Strezov V, Chan K., Ziolkowski A., Nelson P. (2011): Influence of pyrolysis temperature on production and nutrient properties of wastewater sludge biochar. J. Environ. Manage. 92: 223–228. Hussain F., Bronson K., Yadvinder-Singh, Bijay-Singh, Peng S. (2000): Use of chlorophyll meter sufficiency indices for nitrogen management of irrigated rice in Asia. Agron. J. 92: 875–879. Igalavithana A., Ok Y., Usman A., Al-Wabel M., Oleszczuk P, Lee S. (2016): The Effects of biochar amendment on soil fertility. In: Guo M., He Z., Uchimiya S., editors, Agricultural and environmental applications of biochar: advances and barriers, SSSA Spec. Publ. 63. SSSA, Madison, WI. p. 123–144. Ippolito J., Stromberger M, Lentz R., Dungan R. (2014): Hardwood biochar influences calcareous soil physiochemical and microbiological status. J. Environ. Qual. 43: 681–689. Jeffery S., Verheijen F., van der Velde M., Bastos A. (2011): A quantitative review of the effects of biochar application to soils on crop productivity using meta-analysis. Agric. Ecosyst. Environ. 144: 175–187. Jindo K., Sanchez-Monedero M., Hernandez T., Garcia C., Furukawa T., Matsumoto K., Sonoki T., Bastida F. (2012): Biochar influences the microbial community structure during manure composting with agricultural wastes. Sci. Total Environ. 416: 476–481. Katsvairo T., Cox W., Van Es H. (2003): Spatial growth and nitrogen uptake variability of corn at two nitrogen levels. Agron. J. 95: 1000–1011. Laird D., Fleming P., Davis D., Horton R., Wang B., Karlen D. (2010a): Impact of biochar amendments on the quality of a typical midwestern agricultural soil. Geoderma 158: 443–449. Laird D., Fleming P., Wang B., Horton R., Karlen D. (2010b): Biochar impact on nutrient leaching from a midwestern agricultural soil. Geoderma 158: 436–442. Lal R. (2004): Soil carbon Sequestration impacts on global climate change and food security. Science 304: 1623–1627. Law Y., Weil R., Teasdale J. (2011): Forage radish cover crop suppresses winter annual weeds in fall and before corn planting. Agron. J. 103: 137–144. Law Y., Teasdale J., Weil R. (2012): The mechanism for weed suppression by forage radish cover crop. Agron. J. 104: 205–214. Lawley Y., Weil R., Teasdale J. (2011): Forage radish cover crop suppresses winter annual weeds in fall and before corn planting. Agron. J. 103: 137–144. Lawley Y., Teasdale J., Weil R. (2012): The mechanism for weed suppression by a forage radish cover crop. Agron. J. 104: 205–214. Lehmann J. (2003): Nutrient availability and leaching in an archaeological Anthrosol and a Ferralsol of the central Amazon basin: Fertilizer, manure and charcoal amendments. Plant Soil 249: 343–357. Lehmann J. (2007) A handful of carbon. Nature 447: 143–144. Lehmann J. (2007): Bio-energy in the black. Front. Ecol. Environ 5: 381–387. Lehmann J., Rillig M., Thies J., Masiello C., Hockaday W., Crowley D. (2011) Biochar effects on soil biota—A review. Soil Biol. Biochem. 43: 1812–1836. Lentz R., Ippolito J., Spokas K. (2014): Biochar and manure effects on net nitrogen mineralization and greenhouse gas emissions from calcareous soil under corn. Soil Sci. Soc. Am. J. 78: 1641–1655. Liang B., Lehmann J., Solomon D., Kinyangi J., Grossman J., O’Neill B., Skjemstad J., Thies J., Luizão F., Petersen J., Neves E. (2006): Black carbon increases cation exchange capacity in soils. Soil Sci. Soc. Am. J. 70: 1719–1730. Liu X., Zhang A., Ji C., Joseph S., Bian R., Li L., Pan G., Paz-Ferreiro J. (2013): Biochar’s effect on crop productivity and the dependence on experimental conditions-a meta-analysis of literature data. Plant Soil 373: 583–594. Major J., Rondon M., Molina D., Riha S., Lehmann J. (2010): Maize yield and nutrition during 4 years after biochar application to a Colombian savanna oxisol. Plant Soil 333: 117–128. Otterpohl R. (2012): Boosting compost with biochar and bacteria. Nature 486: 187–188. Pan G., Smith P., Pan W. (2009): The role of soil organic matter in maintaining the productivity and yield stability of cereals in China. Agric. Ecosyst. Environ. 129: 344–348. Paz-Ferreiro J., Méndez A., Gascó G. (2016): Application of biochar for soil biological improvement. In: Guo M., He Z., Uchimiya S., editors, Agricultural and Environmental Applications of Biochar: Advances and Barriers, SSSA Spec. Publ. 63. SSSA, Madison, WI. p. 145–174. Petersen J., Neves E., Heckenberger M. (2001): Gift from the past: Terra preta and prehistoric Amerindian occupation in Amazonia. In: McEwan C., Barreto C., Neves E., editors, Unknown Amazon. The British Museum Press, London, UK. p. 86–105. Rondon M., Lehmann J., Ramirez J., Hurtado M. (2007): Biological nitrogen fixation by common beans (Phaseolus vulgaris L.) increases with bio-char additions. Biol. Fertil. Soils 43: 699–708. Sarkhot D., Berhe A., Ghezzehei T. (2012): Impact of biochar enriched with dairy manure effluent on carbon and nitrogen dynamics. J. Environ. Qual. 41: 1107–1114. Saxton A. (1998): A macro for converting mean separation output to letter groupings in Proc Mixed. In: Proceedings 23rd SAS Users Group International Conference, Nashville, TN. 22-25 Mat. 1998. SAS Inst., Cary, NC. p. 1243–1246. Schmidt H., Kammann C., Niggli C., Evangelou M., Mackie K., Abiven S. (2014): Biochar and biochar-compost as soil amendments to a vineyard soil: Influences on plant growth, nutrient uptake, plant health and grape quality. Agric. Ecosyst. Environ. 191: 117–123. Schmidt M., Rapp Py-Daniel A., de Paula Moraes C., Valle R., Caromano C., Texeira W., Barbosa C., Fonseca J., Magalhães M., Silva do Camo Santos D., da Silva e Silva R., Guapindaia V., Moraes B., Lima H., Neves E., Heckenberger M. (2014): Dark earths and the human built landscape in Amazonia: A widespread pattern of anthrosol formation. J. Archaeol. Sci. 42: 152–165. Singh B., Singh Y., Ladha J., Bronson K., Balasubramanian V., Singh J., Khind C. (2002): Chlorophyll meter-and leaf color chart-based nitrogen management for rice and wheat in Northwestern India. Agron. J. 94: 821–829. Smith J., Collins H., Bailey V. (2010): The effect of young biochar on soil respiration. Soil Biol. Biochem. 42: 2345–2347. Sohi S., Krull E., Lopez-Capel E., Bol R. (2010): A review of biochar and its use and function in soil. Adv. Agron. 105: 47–82. Spokas K., Reicosky D. (2009): Impacts of sixteen different biochars on soil greenhouse gas production. Ann. Environ. Sci. 3: 179–199. Steinbeiss S., Gleixner G., Antonietti M. (2009): Effect of biochar amendment on soil carbon balance and soil microbial activity. Soil Biol. Biochem. 41: 1301–1310. Steiner C., Teixeira W., Lehmann J., Nehls T. de Macêdo J., Blum W., Zech W. (2007): Long term effects of manure, charcoal and mineral fertilization on crop production and fertility on a highly weathered Central Amazonian upland soil. Plant Soil 291: 275–290. Uchimiya M., Lima I., Klasson K, Wartelle L. (2010): Contaminant immobilization and nutrient release by biochar soil amendment: Roles of natural organic matter. Chemosphere 80: 935–940. USDA-NASS. (2016): Organic Survey. Volume 3 Special Studies Par 4. U.S. Dep. Agric.-National Agric. Statistics Serv., Washington, DC. Available at https://www.agcensus.usda.gov/Publications/2012/Online_Resources/Organics/ (accessed 23 Jan. 2017). USDA-NASS, Washington, DC. Vaccari F., Baronti S., Lugato E., Genesio L., Castaldi S., Fornasier F., Miglietta F. (2011): Biochar as a strategy to sequester carbon and increase yield in durum wheat. Eur. J. Agron. 34: 231–238. Wang G., Ngouajio M., Charles K. (2010): Brassica biofumigants improve onion (Allium cepa L.) and celery (Apium graveolens) production systems. J. Sustain. Agric. 34(1): 2–14. Weil R., White C., Lawley Y. (2009): Forage radish: New multi-purpose cover crop for the Mid-Atlantic. Fact sheet 824. Available at https://enst.umd.edu/sites/enst.umd.edu/files/_docs/FactSheet824%20Weil%20et%20al%202009.pdf (verified 12 Apr. 2017). Maryland Coop. Ext., College Park. White C., Weil R. (2011): Forage radish cover crops increase soil test phosphorous surrounding radish taproot holes. Soil Sci. Soc. Am. J. 75: 121–130. Wilson K. (2014): How biochar works in soil. The Biochar Journal, Arbaz, Switzerland. Available at www.biochar-journal.org/en/ct/32 (accessed 23 Jan. 2017). Yin X., McClure M., Jaja N., Tyler D., Hayes M. (2011): In-season prediction of corn yield using plant height under major production systems. Agron. J. 103: 923–929. Zavalloni C., Alberti G., Biasiol S., Delle Vedove G., Fornasier F., Liu J., Peressotti A. (2011): Microbial mineralization of biochar and wheat straw mixture in soil: A short-term study. Appl. Soil Ecol. 50: 45–51. 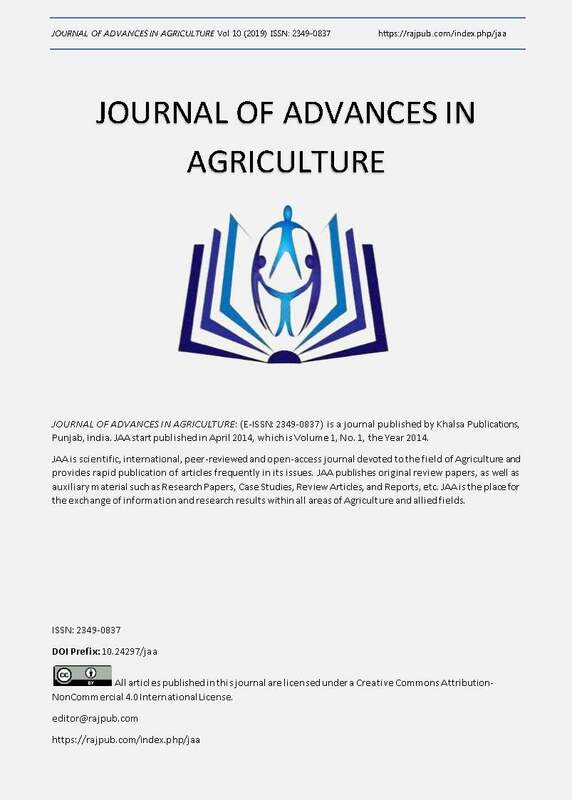 Zhang A., Cui L., Pan G., Li L., Hussain Q., Zhang X., Zheng J., Crowley D. (2010): Effect of biochar amendment on yield and methane and nitrous oxide emissions from a rice paddy from Tai Lake plain, China. Agric. Ecosyst. Environ. 139: 469–475. Zheng W., Holm N., Spokas K. (2016): Research and Application of Biochar in North America. In: Guo M., He Z., Uchimiya S., editors, Agricultural and Environmental Applications of Biochar: Advances and Barriers, SSSA Spec. Publ. 63. SSSA, Madison, WI. p. 475–494.